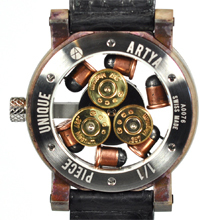 After the worldwide success of the Son of a Gun - watch containing real bullets - ArtyA is proud to announce the newcomers of the 2012 collection. Come and discover these and many more fabulous novelties at our booth P03 in the Palace of Baselworld (8-15 march). 1. The ArtyA Son of a Gun Camouflage. A revolutionary patented and ArtyA-invented process gives the case a never seen before iconoclast look. It is a tribute to the camouflage strategy used by animals and humans alike. 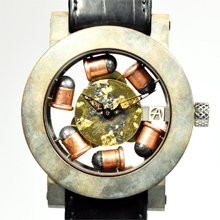 With the inner dial sprinkled with gunpowder and goldleaves, the piece showcases six real 6mm Flobert bullets suspended in the dial. 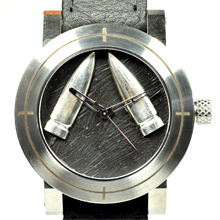 The back of the watch features a unique rotor made of 3 P38 cartridges almost like the barrel of a revolver. 2. The ArtyA Son of a Gun Werewolf Bullet. The Son of a Gun Werewolf Bullet features a silver bullet that was forged and cut up during full moon. A silver bullet can kill a werewolf and reminds us never to be afraid and that life, like silver, is valuable and is not to be wasted.